Washington, NJ: A new salt drying system from process equipment manufacturer The Witte Co., Washington, New Jersey (www.witte.com), features an integral baghouse collector set atop a vibrating fluid bed dryer to capture up to 100% of fine salt particles entrained in the airstream. Returning the fines to the process for recovery as finished product, the Witte bulk salt drying system eliminates the product waste required in systems using cyclones to exhaust process air along with their need for dust collection, conveying, drum handling and other downstream equipment. Costs for product loss, waste disposal, equipment maintenance and downtime are eliminated. 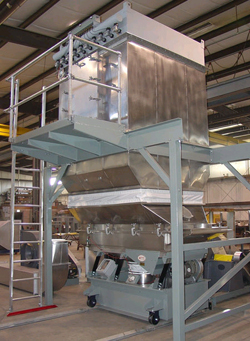 Further, by placing the reverse pulse jet baghouse collector directly over the fluid bed, the energy-efficient Witte bulk salt dryer system also permits 50% of the hot exhaust air to be captured and recycled to reduce energy requirements while cutting the volume of air exhausted by 50%, addressing a key factor in quickly securing permits from the EPA. Ideal for drying road salt, rock salt, water treatment salt, sea salt, food grade table salt and other salt products, the energy-efficient Witte salt drying system combines the vibrating fluid bed dryer and integral baghouse collector with heating and cooling supply units and optional screeners and vibrating conveyors, all featuring T-316L stainless steel in product contact areas to prevent corrosion. The structural steel may be fabricated from a choice of stainless steel or epoxy painted carbon steel with a range of finishes to meet industrial, food grade sanitary and/or pharmaceutical requirements.